The Assignment: Record a piece of music entirely on the go. Step 3: Record a piece of music based on the planning in Step 2. Assume in advance some adjustments to your plan will be necessary after reality sets in. 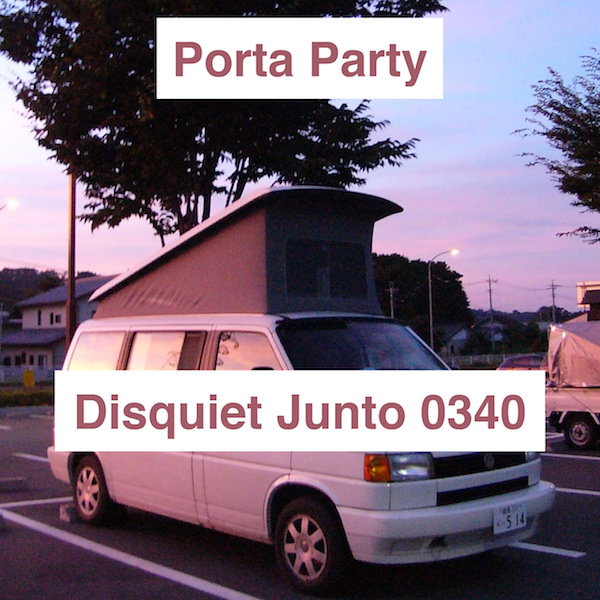 Step 1: Include “disquiet0340” (no spaces or quotation marks) in the name of your track. Step 2: If your audio-hosting platform allows for tags, be sure to also include the project tag “disquiet0340” (no spaces or quotation marks). If you’re posting on SoundCloud in particular, this is essential to subsequent location of tracks for the creation a project playlist. Deadline: This project’s deadline is 11:59pm (that is, just before midnight) wherever you are on Monday, July 9, 2018. This project was posted on Thursday, July 5, 2018. Length: The length of your track is up to you. Keep your battery capacity in mind. Title/Tag: When posting your track, please include “disquiet0340” in the title of the track, and where applicable (on SoundCloud, for example) as a tag. Thanks to Jason Richardson for inspiring this project. I’m using an old track, created on the road during more than two years travelling around Spain, France and Argentina. I use to travel with a microphone (usually an AKG451) a tiny interface (babyface), my laptop, a good pair of headphones, and one travel friendly instrument. Ukulele is a classic but so is my charango. Spent one hours listening in my vault for some travel recording and found this completed track. This one started in a rental house in Barbate, Spain, in December 2013. I recorded the basic charango track there. Then, back home in Paris I recorded an upright bass at home. Fast forward to February next year, and while visiting my parent’s house in Argentina I discovered some forgotten percussion instruments that I used to complete the track (recorded in the garden). It wasn’t making it yet so it stayed on my vaults. Then, on a holiday trip with a friend of mine, sax player, I was carrying my travel kit and he happened to have his own travel companion, a recorder (flute). He played that solo part that sounds like a quena or pan flute but it’s a simple recorder. I added some soft pad synth to glue everything and mixed in Paris. Eventually the track ended up sounding quite polished but it started as a raw-recorded acoustic charango jam. Thanks Marc to make me remember this one, I’m happy to listen again and post it for the first time in my soundcloud. My husband was making a run to the market, so I tagged along with norns. Everything was made and recorded with norns in-between our home, the market, and back. I made the beats and melody/kalimba/mellotron parts separately, with Foulplay, recording them to Tape each time. I then imported everything to MLR and played around for a few minutes, recording several short takes to Tape. This is my favorite of the 3 1/2 takes. Logic was used to normalize, and bounce as an mp3. Music made with nothing but a laptop and my headphones on an Amtrak train, in my mom’s living room, and on a bench at the Brooklyn Botanic Garden. Samples are from “Leave My Blues At Home” by the Allman Brothers, “Blueberry Hill” by Fats Domino, “Mood Indigo” by Duke Ellington, and a blue whale song downloaded from Wikipedia. I took my D-05, a battery powered Roland midi keyboard, a DL-8 delay, and two PCM recorders outside - one recorder sending audio of the garden into the back of the D-05, and then that goes via the DL8 into the second recorder that records all the sounds. I ad lib over the garden and neighbourhood sounds. Simple, and fun! some drums and things under rain runoff. Created on my back steps with an iPad, a delay pedal (runs on 12v) and my laptop. I recorded a simple diatonic tune using Garageband on my iPad then imported it into Samplr. Did a short improvisation using the Looper mode with some delay and manipulation of the filter. I also captured a bit of the sound and looped it throughout much of the track. I recorded several takes on my laptop then combined two of them. Added a fade out at the end. Mr. Pharis was a local, 19th century figure who died under mysterious circumstances. I’ve been retracing his history. Much of it on foot. 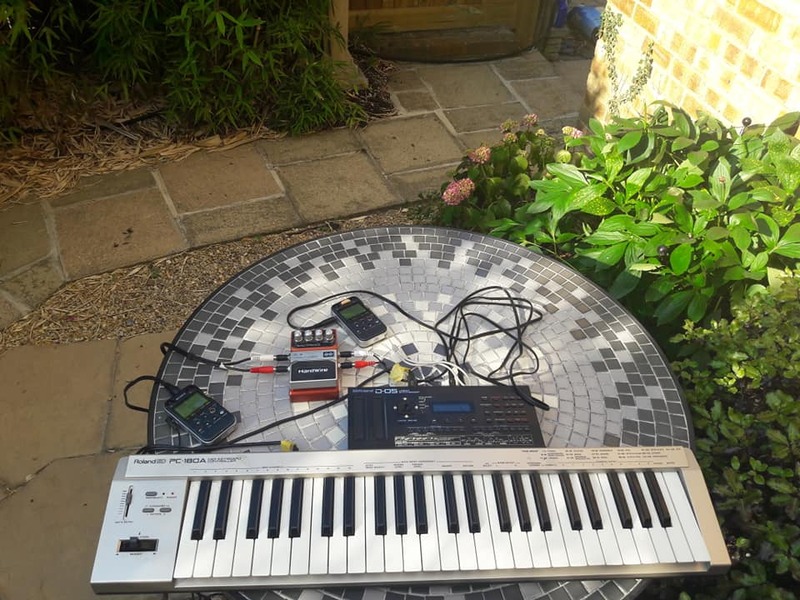 Equipment: A simple, battery-driven Theremin (pitch controllable only) connected to the great cheap nasty Korg Monotron Delay (a combination which works out fine recorded via line); recorded via air with a Zoom H1n (new). Recording was done on the old southern graveyard of Munich (‘Alter Südfriedhof’) while walking backwards (bonus points! ), my beloved woman recording while following me. Tourist and natives seemed disturbed and may have considered us as some kind of ghost busters hunting electronic voice phenomenons. You can hear airplanes, church bells and our steps in the gravel, and, of course, the Theremin resonating in the Monotron Delay. We did many recordings, most of them unusable because of wind noise or other extraneous noises. Because of these problems I repeated the only (in my ears) usable part for five times to have some kind of repetitive musical structure. Recorded using Alessandro Petrolati’s Pulsaret on my iPad. This week the weather in Denver was on and off again Rainy. Gear: Ipad, Laptop, accordion, broken guitar, slinky and a pig squeaker. I started with a sample of the rain on a busy corner that was along a commuter industrial route. I then took a sample from a video at 7-11 of the pig flying and making noise. Upon exit I snuck up on the delivery truck and recorded cases of coke being unloaded. I then was tossed in the back of a Black Malibu with tinted windows and forced to attempt to play my accordion. I was stuck in there for a day escaping to a train deserted area. I used a slinky to capture some video and sound that was ran thru a drum randomization patch I built in MAX for Live that was blended with a clip of the 2 instances of the rain and 1 of the truck. I utilized a slice of the delivery truck to create the MIDI for some additional drums, I used this as a starting point for creating the drum triggers that were blended with an 808 sound and the patch. I used this to create an area to place the train accordion recording and the broken guitar strums I recorded to video and used the sound from. It was on the go, though I didn’t go too far: just to a neighbor’s house where I was taking care of things while he was away, like his sadly detuned piano and his chickens. Both of which I recorded with my cellphone. Played with the audio on my laptop (unplugged!) and came up with this. Made entirely using sounds from the environment in real time. Omni condenser > pre-amp > Norns > MLR. A little compression/verb added in Logic after. No other editing, everything performed live on Grid. I thought this would sound good combined with Alice Coltrane. Very fun! I love the ability to play on the run. Nice setting and creative fun.